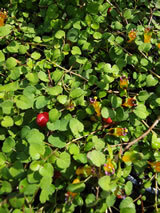 Dainty spreading ground cover shrub with heart-shaped green leaves on slender stems. Through the summer a mass of green and yellow flowers face upwards, showing off the distinctive blue pollen. These are followed by deep red berries with a plum-like bloom. Prefers a moist semi-shaded site, tolerates frost though may become semi-deciduous. Will tolerate drought once established. Grows in part or full shade. / Will tolerate very hard frosts.